The ADF receiver can tune the 190 kHz to 1750 kHz section of the AM band. The lower frequencies of 190 to 550 kHz are the realm of NDBs, or Non Directional Beacons, which are operated by the FAA or Coast Guard, while the remainder is the conventional AM broadcast band. 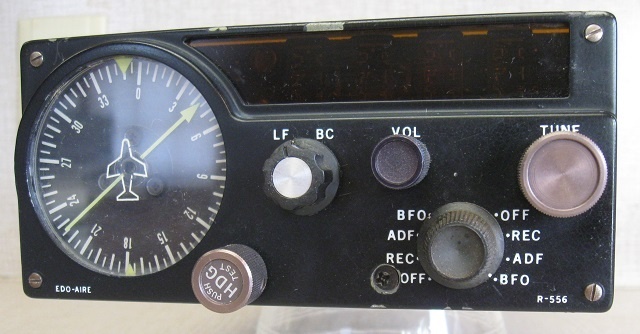 When the selector switch is in the REC position, the ADF has no direction-finding capability, but will provide good audio quality for positive identification of the station. When the switch is in the ADF position, the indicator needle will point to the station tuned in and indicated on the digital display. When the airplane heading changes, the ADF needle moves. To navigate, you read the angle between the needle and the nose of the airplane as a bearing relative to the nose. The beat frequency oscillator (BFO) is used to tune in and identify CW signals. Through a process known as tracking, an aircraft may be flown to or away from a radio beacon on any desired course. The procedure includes a trial-and-error process of determining wind correction angle. The simplest use of the NDB is homing, where the pilot arrives at the station by changing the plane's heading so that the ADF indicator remains on zero. The classic war movie Tora Tora Tora features a scene where the attacking Japanese aircraft use a Honolulu radio station that played Hawaiian music all night as a beacon to home in on Pearl Harbor. In its heyday, ADF supplanted the VOR navigation system. While VOR signals are limited to line-of-sight transmission, NDB signals, being low frequency AM, can travel great distances. On the down side, these signals are subject to the same problems of static and fading that plague the AM broadcast band. The use of radio signals for aircraft navigation is almost as old as the electronic medium itself, although many of the earliest efforts were experimental and haphazard. A more formalized system was developed about the same time commercial aviation was in its infancy. And that began with Henry Ford. While Ford is remembered as a pioneering automotive icon, he really saw himself as being in the transportation business. His vision and financial backing led to the development of the Ford Tri-Motor, along with an airline—the Ford Air Transport Service—and the first the first true airport and passenger terminal located in Dearborn, Michigan. The service began in 1925, connecting Chicago, Detroit, and Cleveland. These airfields included the first radio beacons, designed by Ford engineers. The system guided any properly-equipped planes to a Ford airport from fifty miles out. Today, many NDBs have been decommissioned, or are simply not repaired when they finally break down. The system still officially exists in FAA regulations, and NDBs are marked on the sectional charts used for aircraft navigation. They are also listed in the FAA's Aircraft Facility Directory. NDB receivers have all but disappeared from private aircraft, owing to FAA regulations which state that all navigation equipment be operational, or be removed. GPS is the primary navigation aid used in general aviation today, while the traditional VORTAC system remains as a backup. 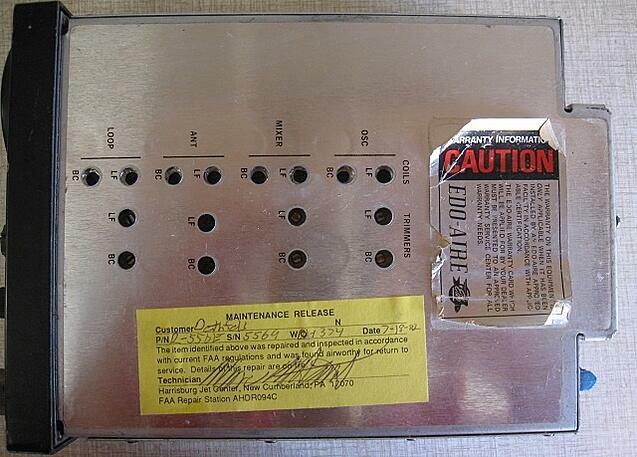 This ADF receiver lives on a shelf in the hanger of a Piper Cherokee that I fly. It shares the space with several other cool-looking but no longer functional aircraft instruments.